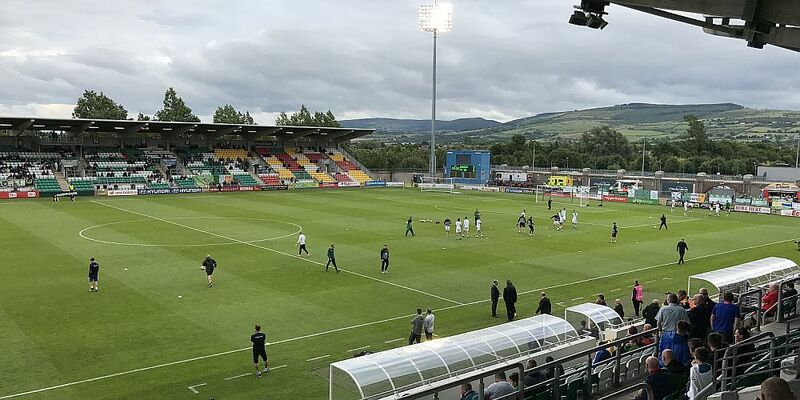 After a year in Austria, followed by two in Evian, Burnley returned to Ireland last week for pre-season, this time basing themselves just a few miles outside Dublin ahead of a first pre-season fixture against Shamrock Rovers. Booking flights from Manchester at 8 a.m. seemed a reasonably sensible idea a few weeks ago but the thought did cross my mind that a later flight might have been a better idea when the alarms started ringing last Thursday morning at some unearthly hour. There was certainly a flavour of claret and blue at the airport and I’m sure that was also similar for later flights that day and during the following morning as Burnley supporters descended on the Irish capital for our game on the Friday night at the Tallaght Stadium some 20 km south. We’ve played three times previously in the Republic. Two of those, in 1963 and 2008, were 45 years apart to the day against Manchester City and Bohemian at Dalymount Park while we played in Cork four years ago. Dalymount Park didn’t look at its best almost a decade ago. It looks far worse now with virtually only one side of the ground left open and quite honestly looking derelict. We were staying close to the ground and went in to have a look; it’s sad to see what was once the national stadium looking in such a poor state. This was never going to be entirely a football trip in a city with lots of history and culture along with its Guinness and Temple Bar but we did take the opportunity to see the Aviva Stadium and also made an early journey down to Tallaght to watch Shamrock’s 3-2 Europa League defeat against Czech Republic team Mladá Boleslav on the Thursday night with Shamrock’s first goal an absolute stunner from Graham Burke. Friday was our match day. Positive news was coming from Carton House that all was well. The internationals who hadn’t reported back in the previous week were all there, including new signing Jonathan Walters who took our total of Ireland internationals to five. They were joined by Jack Cork a day later having completed his move from Swansea via a few photographs close to Terminal 3 at Manchester Airport. In Ireland, five Irish internationals and now a player called Cork but any rumours of moves for Dion Dublin, Shaun Derry and Neil Kilkenny were quickly played down. Having enjoyed the Guinness Storehouse during the day, we were among the first to arrive at Tallaght via the Luas tram system. With match tickets in hand we made our way into the Maldron Hotel which eventually started to fill with more and more Burnley supporters. One fan, from Limerick, introduced himself but most had flown or sailed over for the game to give the hotel another noisy session following on from the Celtic visit a week earlier. The welcome from the home fans, as in Cork in 2013, was warm but unlike Cork there was no segregation in the ground with us all sat in the one stand. It’s a while since I’ve been to a game featuring Burnley and Rovers that was so relaxed in terms of the mixing of supporters. The home supporters were certainly looking forward to seeing the Irish lads in the claret and blue; maybe not so much Stephen Ward who has played for Bohs who are their big rivals. In the first half they were treated to Walters while the other four all occupied places on the bench. The first half line up gave us the chance to see all of the new signings with Charlie Taylor in at left-back and Cork starting in the centre of the midfield with Steven Defour, still sporting his new hair colour. We won a couple of corners in the first two or three minutes as we pushed on at a young Shamrock team but it didn’t take us too long to open the scoring with Cork setting up Walters to open his account, much to the delight of those spectators in green. It was the only goal of the first half which saw Walters replaced by Dan Agyei, but there could have been more and we played some good stuff with one player standing out, that being Defour whose future at Turf Moor remains a talking point. Shamrock had their moments too with Tom Heaton forced into one good save down to his left hand side. Nick Pope was also forced into one good save in the second half; it was a spectacular one from a shot fired in from distance. But this was the half when Burnley added some more goals and gave us the big 4-0 scoreline at the end. Ashley Barnes doubled the advantage. He latched on to a well played long ball through from Tom Anderson. His first touch took the ball under control, his second was a shot from over 20 yards that nestled into the bottom corner. Goal number three saw Robbie Brady and Ward combine down the left. Ward’s cross was deflected back to Brady. He took it past a defender with a right foot touch before stroking the ball into the net with his left. If Defour had been the stand out player in the first half, then it was certainly Brady in the second although it was his best mate Jeff Hendrick who played the major part in the final goal. His shot hit Sam Vokes and looped in. Sam makes a habit of this on Ireland tours. He claimed a goal at Cork from a Keith Treacy shot with our first ever Republic of Ireland international suggesting Vokes only got it because of his fat arse. That was it. A 4-0 win in a game that was played in terrific spirit and was enjoyed by supporters from both sides. Sean Dyche was happy with everything. “We are only one week in and it takes your body and mind time to bring back together the little details, but I felt they delivered it really well, so overall I am pleased,” he said. That was it, just another day for us after that before our Sunday morning flight home, and don’t my feet know it. Why is it you walk so damn far on these trips? It’s been a good trip though and with good company too. It’s my second visit to Dublin and, like the first, one proved to be very enjoyable. Shamrock: Kevin Horgan, Sam Bone, Cian Collins, Dean Carpenter, David McAllister, Richie English (Dean Dillon 61), Aaron Bolger (Harry Cornally 40), James Doona (Darren Clarke 61), Michael O’Connor, Sean Boyd, Tim Linthorst. First Half: Tom Heaton, Tendayi Darikwa, James Tarkowski, Ben Mee, Charlie Taylor, Johann Berg Gudmundsson, Steven Defour, Jack Cork, Aiden O’Neill, Jonathan Walters (Dan Agyei 34), Andre Gray. Second Half: Nick Pope, Matt Lowton, Tom Anderson, Kevin Long, Stephen Ward, Fredrik Ulvestad (Dan Agyei 78), Ashley Westwood, Jeff Hendrick, Robbie Brady, Sam Vokes, Ashley Barnes (Chris Long 85).